Azerbaijani delegation members ripped posters off the wall at the Eastern Partnership civil society forum in Batumi on November 20. 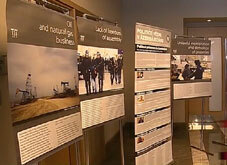 According to the Georgian media, the posters had photos of Azerbaijani President Ilham Aliev and armed police officers, it was also written that human rights have been violated in Azerbaijan. The information was confirmed by one of the organizers of the event, editor-in-chief of Rezonansi newspaper Lasha Tughushi. According to him, a Czech NGO published the posters at the entrance of a ballroom that caused protest among some members of the Azerbaijani delegation. Tughushi said that the members of the delegation who ripped the posters off the wall stated that Azerbaijan is not the only place where human rights have been violated and demanded to place banners reflecting situations in other countries as well. The sixth meeting of the Eastern Partnership civil society forum is being held in Batumi on 20-21 November. Newly appointed State Minister for Euro Integration Davit Bakradze is attending the meeting. Georgia is hosting the forum for the first time. Tughushi stated that it is regrettable that such an incident took a place at the international forum. “Positions differ in some cases, people don’t have the same views concerning the same issues. However, it does not mean you should express your protest through such methods,” Tughushi said. The fact caused discussion among the forum participants. Those who ripped off the posters stated that they would no longer attend the forum. “Such violations take place in any country and revealing Azerbaijan as an exception was not right,” Azerbaijani delegation representative Salim Balaev said. Representatives of the Czech NGO stated that they have been studying the human rights violation in Azerbaijan for years. “They ripped off and stole the posters,” they said.